Dr Hanife Usta Atmaca at Istanbul Training and Research Hospital, Internal Medicine Department, University of Health Sciences, Istanbul, Turkey and colleagues have reported a rare case of Porphyria cutanea tarda. The case has appeared in the Journal of Medical Case Reports. Porphyria cutanea tarda is a rare group of metabolic disorders that can either be inherited or acquired. 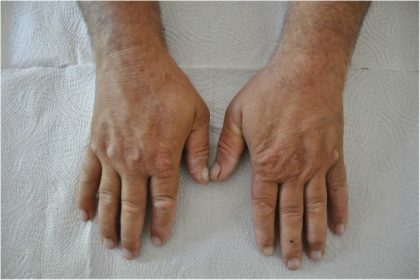 It is the most common type of porphyria worldwide and is caused by a deficiency of uroporphyrinogen decarboxylase, a crucial enzyme in heme biosynthesis, which results in an accumulation of photosensitive byproducts, such as uroporphyrinogen, which leads to the fragility and blistering of sun-exposed skin. The condition affects the liver and skin by reduction and inhibition of uroporphyrinogen decarboxylase enzyme in erythrocytes. Areas of skin that are exposed to the sun can generate blisters, hyperpigmentation, and, sometimes, lesions that heal leaving a scar or keratosis. Liver damage might present in a wide range of ways from liver function test abnormalities to hepatocellular carcinoma. The toxic effect of iron plays a role in liver damage pathogenesis. A 59-year-old Turkish man presented with fatigue, loss of energy, and dark coloured urine. When asked, he declared that hyperpigmentation occurred in his hands and face after exposure to sun since last year and sometimes those skin parts blistered and healed leaving a scar. He used to consume alcohol socially but since last year started to take alcohol on a daily basis. His medical history and family history were both unremarkable. He was a butcher and he consumed over 300 gr of meat on most days. He declared that his complaints exaggerated after consuming large amounts of meat. A physical examination showed that both dorsal regions of his hands had brown pigmented skin lesions. 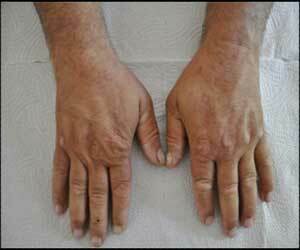 A full skin examination revealed: erosions; scars; and 1-mm, firm, white papules consistent with milieu on the dorsal surface of his hands (Fig. 1). The skin color of his face was also dark and he declared that it happened 6 months ago. His body mass index (BMI) was 38 kg/m2. His pathological laboratory results were as follows: aspartate aminotransferase (AST) 125 U/L (normal 0–50), alanine aminotransferase (ALT) 89 U/L (normal 0–50), gamma-glutamyltransferase (GGT) 1190 U/L (normal 0–55), lactate dehydrogenase (LDH) 268 (normal 0–248), creatine kinase (CK) 174 U/L (normal 0–171), alkaline phosphatase (ALP) 123 U/L (normal 30–120), ferritin 503 ng/ml (normal 23–336), and vitamin B12 1275 pg/mL (normal 145–914). Hepatitis C, hepatitis B, and HIV tests were negative. Autoimmune screening was negative. Urine color was turbid. His porphyrin (24-hour urine) was 832 μg/24 hours (normal ≤ 100); his porphobilinogen (24-hour urine) was 1.65 mg/24 hours (normal ≤ 1.65). We could not fractionate the urine porphyrins because we do not have the necessary equipment to measure carboxylate porphyrins (uroporphyrin and hepta-, hexa-, and pentacarboxyl porphyrin) in our hospital. Our patient was diagnosed as having PCT according to his medical history, typical skin lesions, and supportive laboratory findings. Phlebotomy was started as treatment regimen (450 cc/every 2 weeks). After the sixth phlebotomy, his symptoms regressed and he declared that he felt better. His laboratory analysis also showed improvement (AST 30 U/L, ALT 38 U/L, and ferritin 43 ng/ml. A follow-up was started and an appointment to see him in 3 months was made.